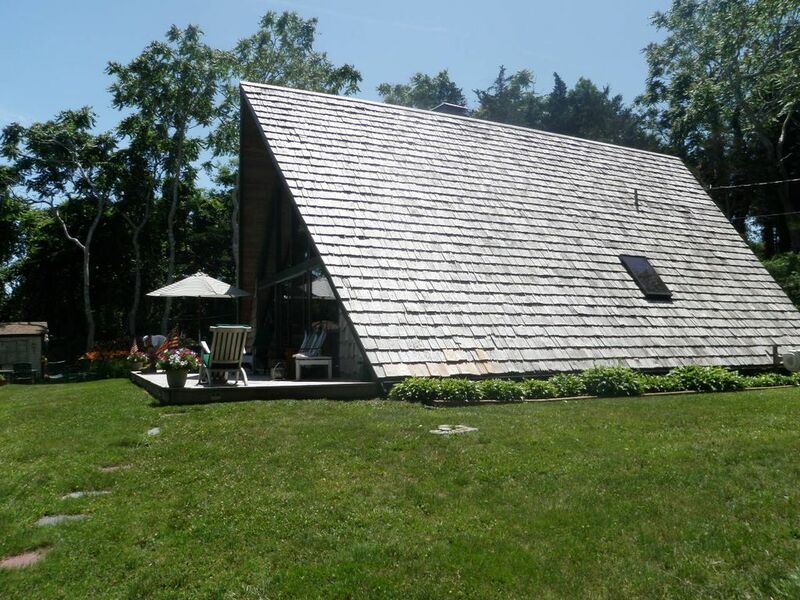 Venha experimentar uma verdadeiramente único férias em Cape Cod nesta pitoresca, confortável, recém-renovado 2 quartos, 2 banho, estilo chalé "A-Frame" casa à beira-mar do tio Harveys Pond. Localizado no final de uma pacata, isolada cul-de-sac na seção exclusiva Barley Neck of East Orleans estabelece este oásis tranquilo, privada com vista panorâmica da orla. Privacidade e solidão convida leitura tranquila no convés ou um jogo de croquet ou bocha no quintal. Um pássaro do paraíso observadores espera por você como você saborear seu café da manhã no deck com vista para a lagoa. Traga as suas canoas, caiaques, stand up paddle-boards ou alugar nas proximidades para desfrutar de toda a beleza deste local requintado. Desfrute de uma noite ao redor da fogueira, enquanto observar as estrelas ou chuva de meteoros assistindo! Dê uma caminhada de cinco minutos Meetinghouse Pond onde você pode lançar o seu barco e cruzeiro "The River" para Pleasant Bay. Tome um selo assistindo cruzeiro local ou apenas relaxar e apreciar o pôr do sol espetacular. Menos de uma milha leva você para East Orleans Village, onde você pode desfrutar de sorvete caseiro na Escola Sundae, Pizza na Zia de, ou jantar no Nauset Beach Club e entretenimento nocturno ao vivo no Barley Neck Inn. Pegar seus peixes e açougueiro bem carnes frescas para grelhar em Nauset Farms. Conduzir ou moto a menos de 2 milhas para desfrutar do surf glorioso e praia de renome no mundialmente famoso Nauset Beach, uma parte do Cape Cod National Seashore. Desfrute de um passeio de bicicleta na Cape Cod Bike Trail, com suas expansivas 20 milhas de pântano de sal, pântanos cranberry e lagoas. Passeie centro de Orleans para desfrutar de várias lojas e restaurantes. Orleans é a casa do time de Cape Cod League Baseball Firebirds onde as famílias trazem suas cadeiras e cobertores sob as luzes para desfrutar de uma noite de beisebol à moda antiga (bastões de madeira!) apresentando os melhores jogadores de beisebol colegial. Orleans é também a casa para a Academia de Artes, teatro ao vivo com a sua "sociedade residente própria. Orleans é verdadeiramente um destino de férias que oferece algo para todos os gostos! • Cozinha completa w / pequeno-almoço assentos bar para 4 W / separados área de refeições acomoda adicionais 6. Great home. Great location. Serene setting and close to everything. Fish were biting and beautiful birds. Thank you. All I can say is WOW. This place is truly a gem. My hubby and I stayed here for 5 nights, and I really don't have 1 negative thing to say. We met the owner at the house -- she was incredibly kind and welcoming -- gave us a quick tour and then left us to get settled in. The accomodations were lovely. The descriptions and pictures were very accurate, and the property was clean and well-maintained. We went to Meetinghouse Pond to go fishing 2 days and spent most of our time @ Nauset Beach. For dinner, we went to Joe's Pub one night and Orleans Public House another -- both terrific. I have been hesitant to write a review, b/c I want to be sure it's available the next time I go! All in all -- spectacular 1st HomeAway experience, and we will certainly return to this Orleans Chalet. Thank you! We look forward to your return. Thank you CB & Fam! Look forward to having you back. Clean, newly renovated and beautifully furnished. Outside grill, fireplace and shower a plus. No damp (heard that this can be an issue in wooden houses on the cape). Renters provided many items we would have to bring ourselves in Europe (toilet paper, washing-up and laundry soap, napkins etc). WIFI had good speed and connected up with no issues. Monika was very welcoming and we felt we could have called her if there were any issues, but there weren't. No traffic. Wooded nature reserve left and lake in front are idyllic - could spend all day on the deck! We counted 45 bird species including humming birds and nesting woodpeckers. Also frogs, turtles, rabbits, squirrels, chipmunks and a deer. We hired a canoe for a week from Goose Hummock, which they delivered and canoed on the lake and down the river from Meeting House Pond. The lake is somewhat green and deep for swimming - Meeting House Pond, which is walking distance is nicer. Also beaches at Nauset, Skaket and Crystal Lake all nearby. Thank you H & K! We'll be back next year! Dream getaway in perfect secluded location on lake. My family of 5 stayed here in June and could not have been happier. My children kayaked on the lake after spending the days at nearby Nauset Beach and Skaket Beach. Each night we relaxed by the outdoor firepit and gazed at the stars reflecting off the lake. Perfect!!!! Owners are the friendliest couple you could imagine. Their personal touches were icing on the cake. Thank you!!!!!!!!!!!!! We are open to weekend or other mid-week stays where dates are available after June 1st of each year. Spring season actually ends on Saturday, June 10th. Fall season actually begins on Saturday, September 16th. Website glitch does not allow overlap of dates for Saturday same day turnover. 10% discount for 2 week rentals; 15% discount for 3+ week rentals.